Pressure relief cushions provide an excellent way to prevent pressure ulcers in those with low levels of mobility, but not all pressure relief products are created equal. The Matrx Flo-tech Contour Visco Soft Density Pressure Relief Wheelchair Cushion is moulded from temperature-sensitive viscoelastic foam, and is suitable for those at very high risk of pressure sore development. As the foam warms, the contoured surface area conforms to the shape of the person's body, improving posture, increasing comfort and maximising the surface area in contact with the person, thereby optimising pressure reduction. This cushion is available in a range of sizes and with a choice of four covers. Select your desired options using the drop-down menus above. The Matrx Flo-tech Contour Visco Soft Density Pressure Relief Wheelchair Cushion incorporates temperature-sensitive foam which conforms to the user's body. The contoured shape works to maximise the contact surface area, delivering exceptional levels of comfort and optimising pressure reduction. This cushion works to ensure the user is as stable and secure in their seated position as possible. The pommel in the centre contributes to pelvic stability and proper positioning while also improving posture. The contoured design of the cushion also results in raised edges for increased lateral support, further enhancing stability. 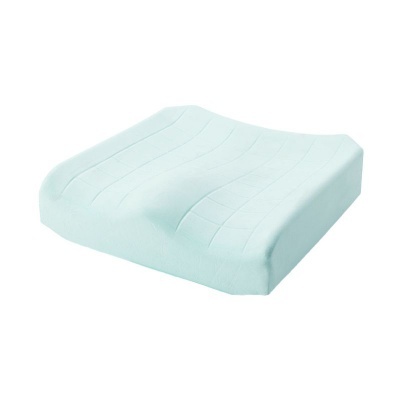 The covers supplied with this cushion are ingress-resistant, and can be fitted to all Matrx cushions with the exception of the Low-Profile, Original and Premier. Treated with a fluorocarbon-based fluid repellent finish to prevent wetting and reduce risk of contamination, these covers prevent fluid ingress and aid in the prevention of pressure ulcers. These innovative covers place patient comfort first and help to prevent skin maceration.